All the Ways Facebook Follows You: True or False? I carry my phone everywhere I go, and the last thing I need is an app like Facebook listening in on my private conversations. But is that really what’s going on? In the wake of the Cambridge Analytica scandal — which compromised the personal info of up to 87 million people on Facebook — there’s a whole heap of confusion. Does Facebook actively spy on you? Are they reading private messages and texts? Does the app track your phone calls and location? CEO Mark Zuckerberg has now been grilled by lawmakers and answered a lot of questions, but how does that affect you or me? Let’s take a look how Facebook tracks you — what’s true, what’s not — and what you can do about it all. FALSE: The other day I was talking about prom dress shopping with my daughter. The next time I checked Facebook, ads for frilly dresses showed up everywhere. Has this happened to you? You’re talking about a random product or company and then seen an ad for that same thing? It feels spooky for sure. But, according to Facebook — the fear of 24/7 microphone spying — is all in your head. “Facebook does not use your phone’s microphone to inform ads or to change what you see in News Feed,” Facebook Spokesperson Joe Osborne wrote to me in an email. “We don’t show ads based on what you’re talking about out loud.” Trying to collect and translate that much audio data, “would strain even the resources of the NSA,” former Facebook ad-targeting product manager Antonio Garcia Martinez recently told the Wall Street Journal. Facebook does, however, request access to your microphone — for posting videos or making calls using Facebook Messenger. If you don’t use either of those features, it’s easy to keep it turned off through Facebook settings on your mobile device. 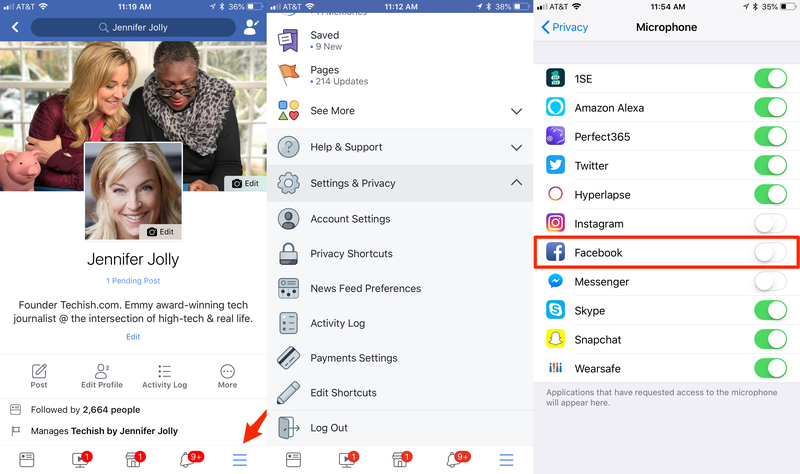 On iPhone, go to Settings > Privacy > Microphone > Facebook (and you might as well do Messenger and Instagram while you’re there too.) On Android, go to Settings > Apps > Facebook > Permissions > Disable microphone. TRUE OR FALSE? Facebook Tracks Your Location. TRUE: Facebook tracks your location for several reasons, including so that you can “check-in” to certain places, letting your friends and family know where you are or where you’ve been. Facebook also uses your location to serve up ads. 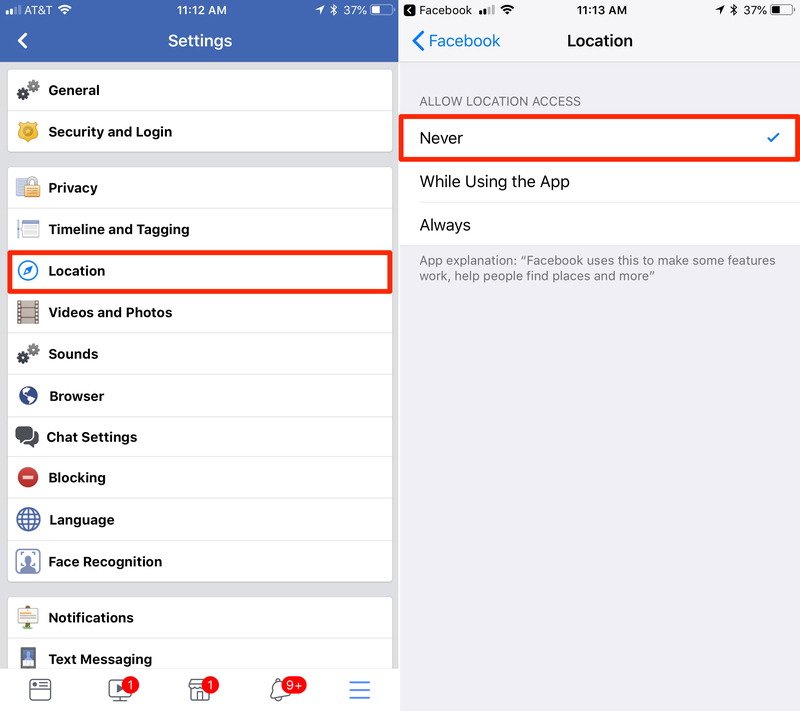 To turn off location tracking on a mobile app, (iOS and Android), go to Settings > Account Settings > Location and toggle “off.” While you’re there, disable location history too. FALSE: Facebook makes the vast bulk of its money from ads, and by default, it uses your profile information — like your interests, age, etc. — to show you ads that it thinks you’ll respond to and hopefully click on. Advertisers and outside companies never actually see your personal information, however, and Facebook says that’s an important distinction. That’s what made the entire Cambridge Analytica situation such a big deal because a third party app developer took the data it had gathered and gave it to someone else. That information is never supposed to leave Facebook — which is why Facebook’s at the center of so much controversy. As a result, Facebook now faces potential fines, regulation, and says it’s taking steps to not every let a breach of this kind happen again. FALSE: Facebook’s mobile app has a feature that lets you sync your texts and calls with Facebook Messenger. This is an opt-in feature, meaning you have to give Facebook permission to do it, and it is only available on Android phones. If you have Facebook Messenger on an iPhone, you can still choose to sync your phone’s contact list with the app, but not calls and texts. Facebook says it does this so you can more easily find your friends and family on its app, and to make using Messenger more natural. The fact that it tracks your call and text history is part of this functionality, but Facebook is adamant that it doesn’t listen to calls or read the content of any text messages you send. It does, however, note the date, time, and who you were talking or texting with. You can quickly purge all of this information — even if you’ve already agreed to it. Under the Settings of the Messenger app, turn off “Continuous call and SMS Matching,” and Facebook says it will delete all previously stored data. You can also empty out your call logs and contacts on the web using Facebook’s contact and call logs page. TRUE: Facebook’s ad business depends on it knowing as much about your likes and dislikes as possible, and it gets some of its information from other websites you visit. A feature called Facebook Pixel invisibly snoops on your web browsing habits even when you’re not on Facebook, and it uses the data it gathers to paint a more accurate picture of who you are. The good news is that you can control whether Facebook uses the web browsing data it gathers to target you with specific ads. 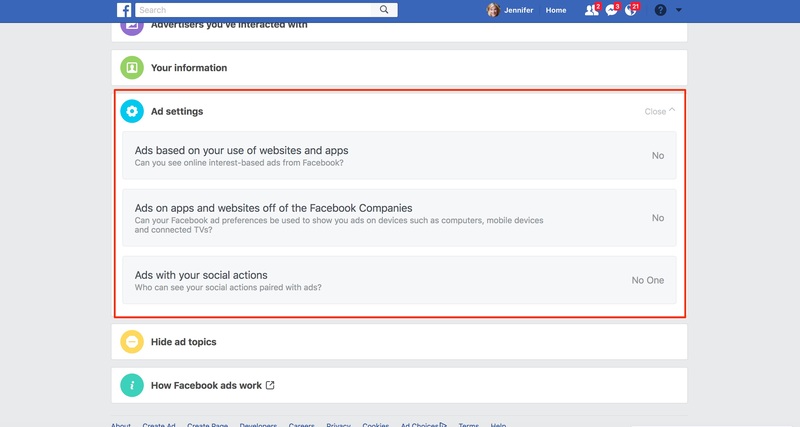 Go to your Facebook profile on a desktop or mobile, then click Settings > Ads > Ad Settings and you can turn off “interest-based ads” under the ad settings section. An additional option is to use an extension on your computer’s browser, such as Ghostery or the Firefox Facebook Container. Ghostery lets you see — and disable — trackers running on web pages, while Facebook Container walls-off the app from the rest of your online browsing. TRUE: Facebook helps advertisers track and target you based on what it calls “offline conversions,” which is an in-store purchase. It’s not nearly as easy to follow these kinds of purchases than those you make right from a web browser, but by partnering with payment providers like Square, call center groups, and retailer loyalty programs, Facebook can show advertisers whether their ads are working on the right people. There’s no easy fix for this, but you can take some steps to keep your brick-and-mortar purchases somewhat private. For example, keep your loyalty cards at arm’s length, using an email address and sign-up information that isn’t associated with your Facebook account. Avoid digital receipts when possible, as that’s yet another way for a retailer to get your email address and make the connection. Doing this will keep data-gathering companies from connecting the dots between your store purchases and your Facebook persona.